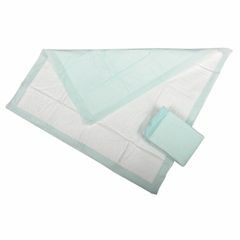 The Protection Plus Polymer-Filled Underpad eliminates waste with Medline Protection Plus disposable underpads with polymer. These odor-reducing pads lock-in fluids, virtually eliminating the need to stack pads to prevent leaks. Polymer underpads available in deluxe or standard weight. Polymer underpad with wings tucks into the sides of the mattress.